Don't worry. Be happy. Keep learning. 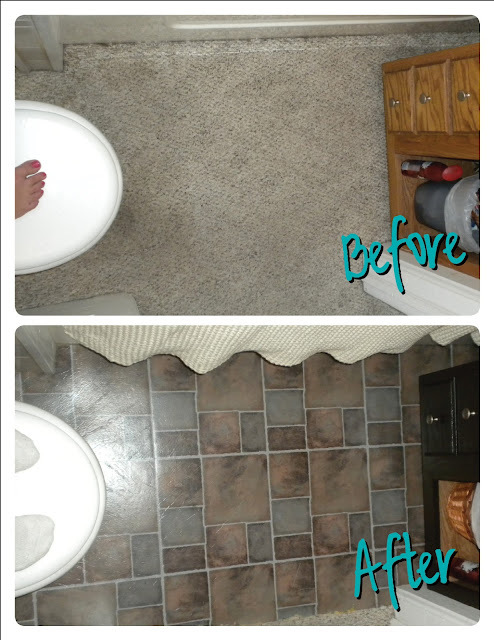 : Bathroom redo. I'd like to begin by saying anyone who installs carpet in a bathroom should get his/her head checked. I don't care if that "anyone" is YOU reading this. Get your head checked. A bathroom is a very moist place. Yes, I said moist. Carpet does not belong there. The carpet in our bathroom has bugged me for (how long have I known Mike?) 4 years! I think mostly because I imagine miniature sized creatures living under the foam and eventually taking over our house. It would be them or the spirit of the dead Amish boy in our basement that eventually does us in. Just kidding, future buyer of our terrific home. I speak nonsense. . . Recently, I got an itch about this bathroom of ours and hastily decided to redo it. Carpet, cabinets, whatever needed done. This bathroom needed a facelift! Our house is still for sale (details here), so any remodeling/revamping/reanything had to be done on a small budget and still look great. 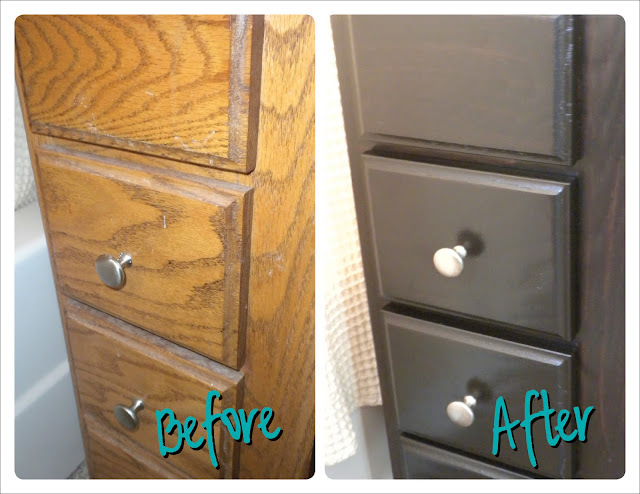 I had been mindlessly surfing Pinterest for 5 hours an hour or so one day last week, and I found a great tutorial on how to stain your cabinets to look more modern. I figured if she can do it, so can I. 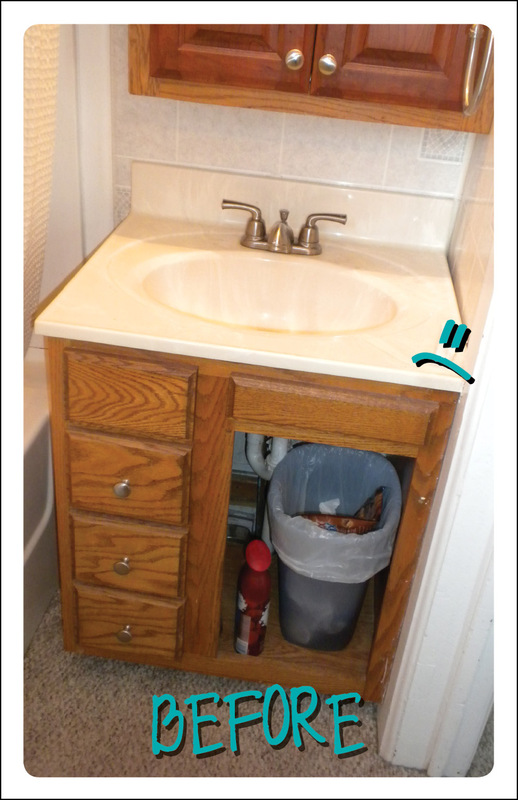 So the plan was to replace the carpet and snazzy-up the cabinets. Got it. I made a trip to Lowe's to get all the supplies I would need for this bathroom overhaul. I only spent $50 and I purchased stain, poly/topcoat, floor tiles, foam brushes, floor prep goo, painter's triangles and mailbox letters. No, the letters weren't part of the project, but we did need them. So I got them. Side note: If you've never heard of painter's triangles, hear it here first. They're amazing. I drove home. Took one last sad look at our ugly outdated bathroom, and got to work. That is when I turned into an animal. 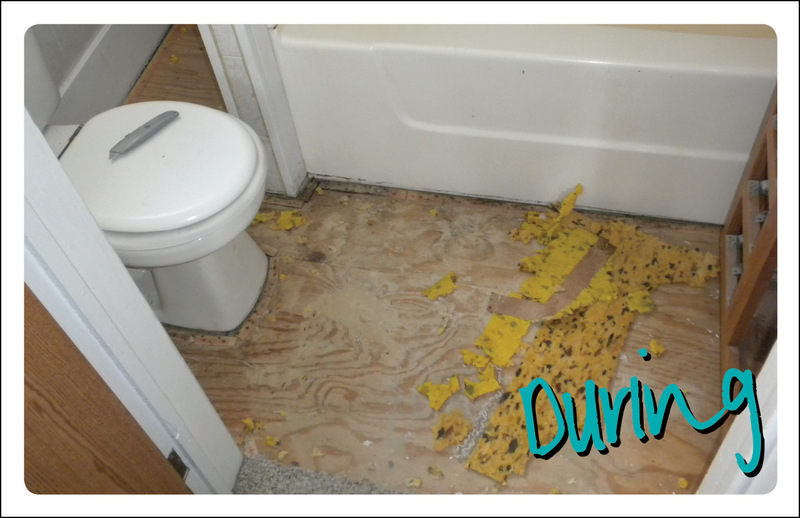 I began ripping up and slicing the carpet, yanking out nails and tack boards and staples, hammering down staples that I couldn't get out of the dang floor, chucking pieces of foam and carpet out the window into our driveway. I was a hurricane. And I was sweaty. 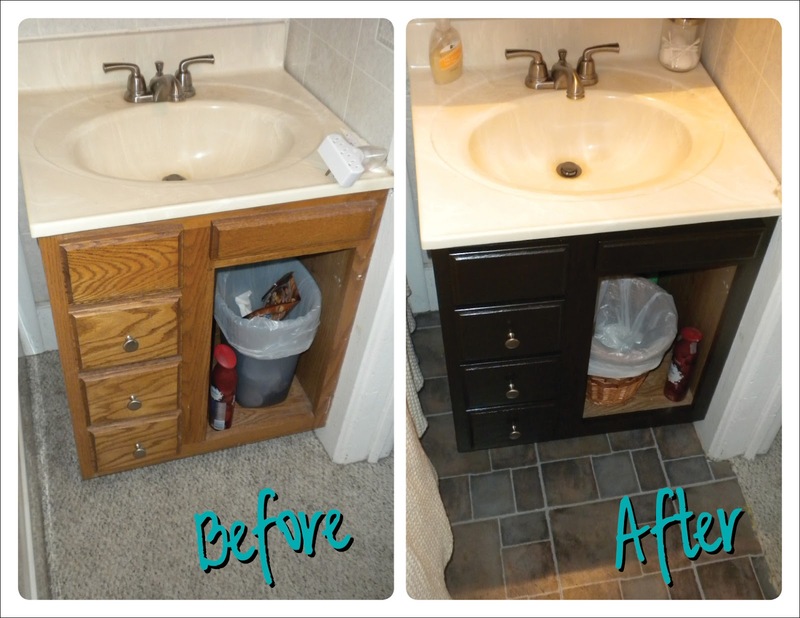 If you want a workout, redo your bathroom, I'm tellin' ya! After the carpet was removed, I got to work on the cabinets. I won't go into great detail on the process of staining because Monica pretty much covers it, and I followed her steps. I didn't use the same brand of stain as she did, though. I found one by Rustoleum called "Kona" and it worked out lovely. I did, however, use one of Mike's old socks like she suggested for staining. That worked great! Thanks, Monica! In between the staining steps, I got to work on the floor. We've used the peel & stick linoleum squares before in our foyer, so I was familiar with the installation process. It's pretty simple. 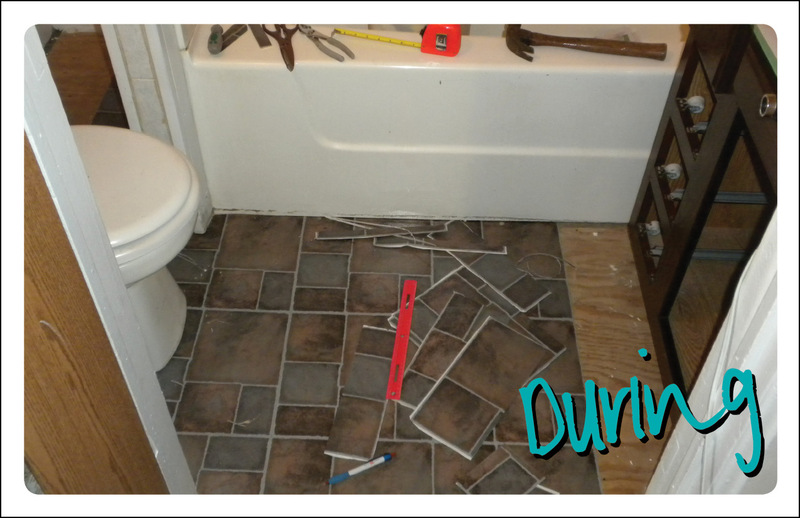 The entire bathroom redo process start to finish took 5 days. We're very happy with the final product, and Mike is very proud of me for taking this on and seeing a great end result. He honestly wanted very little to do with this overhaul - not because it didn't need done, but because this isn't his sort of thing. But it is mine!! See how dirty that carpet was????? We have a door to cover the trash can, but we can't find it. It broke a while back and we hid it before a showing, aaannnddd we're not sure where it is. Once we find it, I'll stain it and install it. Promise. We are still praying for the right buyer. at 4:21 PM Topics: Blog., Design., DIY., Handy Tips., House For Sale. Hi Angie! You did such a great job! I did Monica's stain technique on my coffee table and hallway table and both pieces turned out wonderful. Did you use a different sock for each coat? I did, but am wondering if I could have just used one? I did use the same sock for both coats, then I used the foam brush for the poly coats. The sock was sort of stiff by the time I went to use it for coat #2 and I considered getting a new sock, but it worked just fine. That's awesome that you did this, too! Great job! hi angie. my name is angie just a quick question did u have to do any prep work on wood before staining it? Thank you for the great idea. I lightly sanded the wood to remove most of the finish that was on it, but like I said it was old and most of the finish had worn off over the years. I REALLY like the new stain on the cabinet. What a great idea. I might have to borrow that tip for our cabinets. Good job and great job tackling it yourself. Thank you!! You could totally do it. Everyone who's seen it in person loves it! Wow! That looks great! 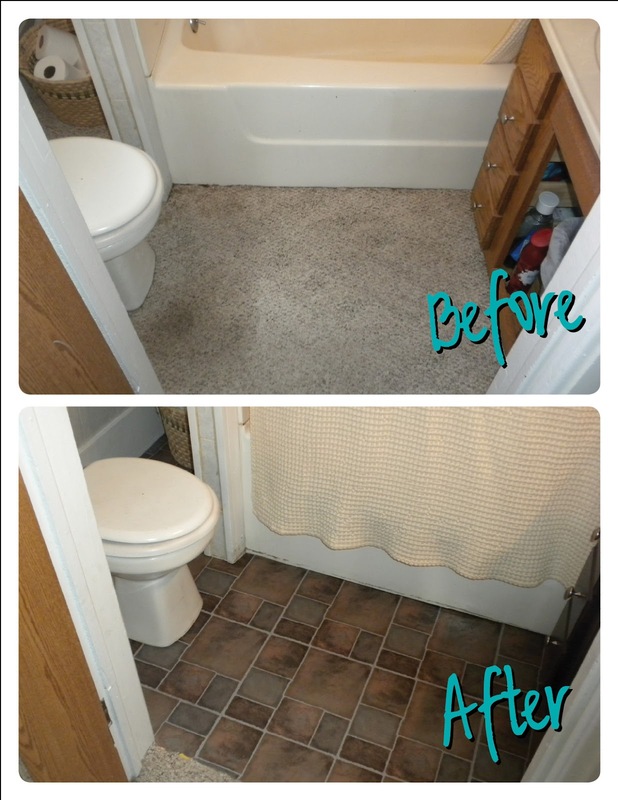 We live in an old house, with carpet in our bathroom...this just makes me want to redo mine! I just may take some time this winter to try this out. I am in the process of working on my vanity. 3 coats on, just did the poly stain & some of the gel started to wipe off with the poly!!! After a panic attack (eekkk!!) I stopped and am letting it dry. Not sure what to do next........ any advise?? Thank you!! What kind of brush are you using to apply the poly? I found the foam brush works best. Definitely let each coat dry completely between each application. You didn't have to sand or remove any of the top coat that was on the vanity before staining? I didn't need to on ours because the wood was pretty worn. You could run some sand paper across yours if you need to. My husband and I attempted this last night and it turned into a disaster. They look horrible and very shiny. We followed the same tutorial you did however, you are the only one we've seen use actual stain instead of the gel. Which is what we are using. I think I understand from your post up above that you did not have to really sand because your wood was worn? But normally you have need to sand it down I think, correct? Thanks so much for your awesome tips and pictures! It's a good idea to sand if your wood has any kind of coating on it. Ours was so old and worn I didn't need to. I preferred the stain vs. the gel only because of two reasons: 1. I couldn't find the gel where I was shopping and 2. I'm familiar with stain and loved that color I found. I'm bummed yours didn't turn out. I don't know MUCH about the process beyond what I did, but perhaps you can use a matte top coat instead of glossy. That could reduce the shininess. Thanks for your reply Angie! We went ahead and sanded them down, although it was a ton of work we did finish and they look great! Thank you for your tutorial tips and for replying to help us out!!!!! So appreciated! How long did each layer dry for? How many days did you finish the staining? It took an hour or two for the stain layers to dry and I think 5 hours for the first poly layer. If I remember right, the second poly coat had to dry (cure) a LOT longer, maybe 12 or 24 hours? Its been so long, its hard to remember exactly. I just followed the directions on the stain and poly cans, to be clear. Also, the entire bathroom redo process start to finish took 5 days. For a more detailed step by step, visit Monica's blog using the link I put in my post. I think you could if you get a gel stain & sand the surface a bit before applying. It'll be thick and stick better. Your redone bathroom looks great except for no door on the vanity. I'm sure you could find a door to match at Habitat for Humanity store. Thanks Judy! We actually did look for a replacement door but could not find one that fit correctly. We ended up putting fabric on a tension rod and that worked just fine. 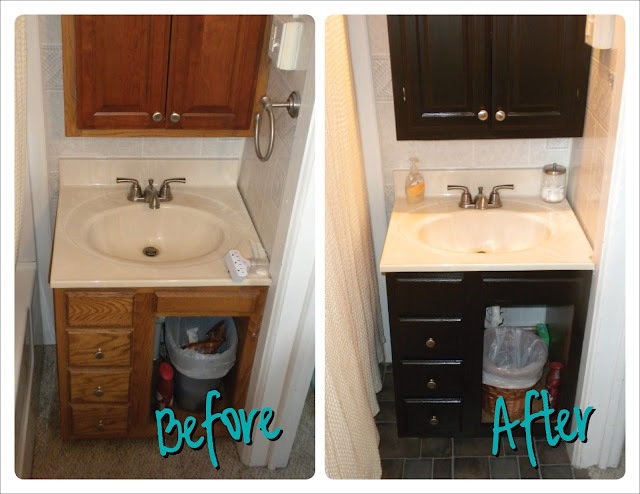 Love your redone bathroom except for the missing door on the vanity. Why not go to a Habitat store and purchase a door -- would definitely look better. What are the names of the products you used -- it is difficult to determine from the photo your provided. I see a quart bottle of a product but can't read the label. What kind of stain did you use? Sadly, I don’t remember the names of the products. The white bottle was an adhesive recommended for use with the tiles because our flooring underneath was rough. The stain was a gel stain in a dark java of some kind - but since it was so long ago, I don’t remember. Can you provide a photo of the bathroom redo or the hallway flooring after a year or so of wear? Does the self-stick tile shrink after a period of time? Thank you. We no longer live in this home and have not for a few years, so unfortunately I can’t provide an update. 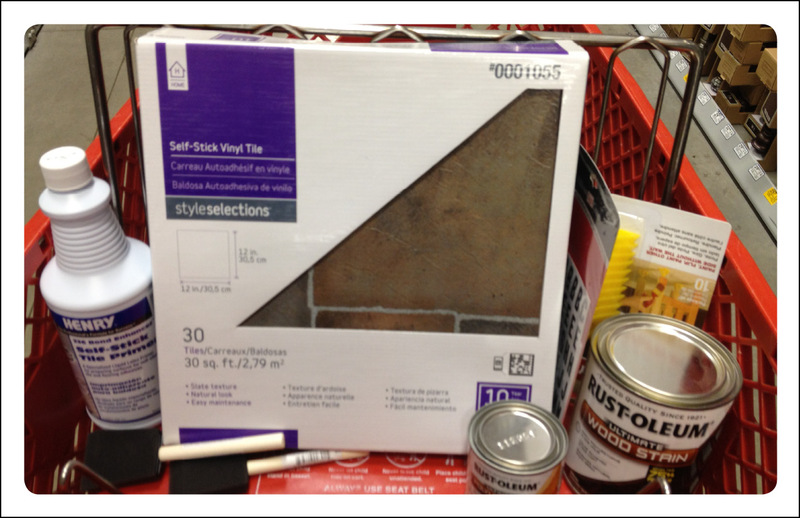 The adhesive that we purchased was supposed to help the tiles stay more secure/reinforce the adhesive already on them. A lot of the wear and tear will depend on the amount of traffic going through. We used the same tiles in the entry of the home as well.